4.3 out of 5 based on 132 bloggers and 40 commenters. Google Chrome is a free premium blogger template adapted from WordPress with 2 columns, right sidebar, fresh look, rounded corners and minimalist. Excellent template for blogs about business, entertainment, internet or software. This doesn’t work. Please advise. Valdeny: Did you try with de english version? Jeremiah: It’s an error on Blogger. Try to upload the template again. A excellent style, very nice. how i change the color blue of template to black!? thanks for offering the free template and it’s realy cool. That’s why I switch to use this tempate. However, when I want to remove the date & auther field. The ‘|’ is still there. So, how can I address this issue by change the xml code? And is there any guide to do the customlization on your source code? It’s not working for Blogger. I’m getting the same error as everyone else. Anyone got a fix? Hello, thank you very much for this template, it’s really very well done and I like a lot. 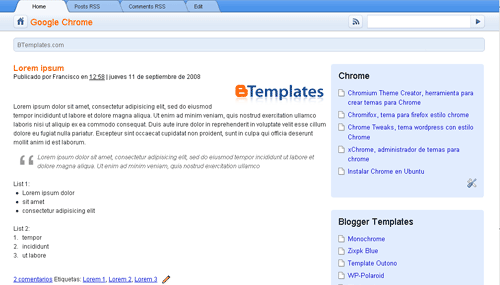 I’m using on my blog (http://blog.darweb.es) but the images that form part of the template are missing. Why?, Do you moved the files referenced from the template?, how can I fix it?. Very nice template; I love Chrome. Thanks alot for sharing this template. Clean and nice. I’m using it at my blog right now. Chromium OS Baby!!! Thanks for sharing. Good job. Perfeito esse template, é lindo, leve e com cores agradáveis. Parabéns! very nice! thanks for sharing this Chrome Template..
@ Valdeny Santos: I know speaking portuguese, so I know that it’s a portuguese error. If it works, I’ll post a comment saying well this template! If not I’ll just say (if there was error) what the error was. People! It realy works! And its beutyfu! I didn’t put it on Games Ptec but VISIT IT! Al importar las plantillas a wordPress me dice que falta la hoja de estilos. Alguien me puede indicar mi error o donde está ese fichero. @Juanchi: Es porque estás instalando una plantilla para Blogger. Nosotros sólo publicamos plantillas Blogger. Si quieres la versión para WordPress, ve al sitio del diseñador (el link aparece más arriba). i an not able to use this template for my project because its in XMl. i want this in HTML. please advice me how can i use this ???? i like it this template… good jobs frends.!!!! !